I was always skeptical that a software program could help me feel more organized about homeschooling. Pencil and paper were my tools of choice. I’m a rabid note-taking, list-making organize-a-holic… so I figured I had it all under control with my monolithic homeschool 3-Ring binder (that my kids call “mommy’s brain“) – doing things the ‘old fashioned’ way. Doing it all on paper wasn’t working for me. Sure, we could get by, but I was bogged down with it all. Never mind that my 3-Ring Binder used to weigh half as much as my SUV (until I purged it this year after digitizing a lot of my school paperwork). You all know how heavy library books are – especially when you are taking home 30 or 40 at a time. My KONOS Curriculum manuals weren’t that easy to carry around, either… and having them with me was a bit of a crutch. 1. There were piles of papers to grade. 2. I always seemed to be behind on the lesson plans because we couldn’t get to the things I planned on the correct days. I beat myself up when we are behind. 3. I was chained to my teacher’s planner book trying to write everything in that we had accomplished in the tiniest print humanly possible because the planner was created by someone else – not perfectly fit for my needs. 4. Relying on having the entire curriculum book in front of me kept me from spending ample time micro-planning my lessons… which ended up leading to ‘winging it’ (and we all know where that leads). Could software really be what I needed? I certainly didn’t need more WORK. I kept hearing about Homeschool Tracker from friends. I even got a free copy of it at a homeschool conference I attended and never installed it; that was, until a friend of mine sat down and showed me how it worked for her. Visual learner that I am, I was intrigued enough to install it. After spending some time with the free version and hearing about all the neat options that the paid version had (such as a Library with a barcode scanning and ISBN entry function), I forked over the money for the “Plus” program – and have never been sorry. 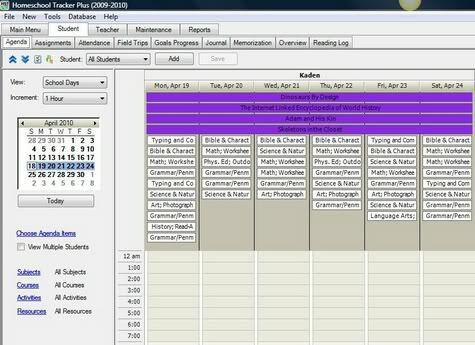 Tracker offers a way to keep up with your school year plans for the kids in every imaginable way. It isn’t just a list or a lesson planner like I was using before with pencil and paper. It is a database that keeps track of EVERYTHING (and fits neatly in a backed up file on my USB drive). Just the report section in Homeschool Tracker alone made all the set-up time I spent worth the plunge. You can print out Assignments, Agendas, Calendars, Lists, Tasks, Field Trips, Memorization, Reading Logs, and Resources. You can print your goals, your entire home library book list, your lesson plans, and your teacher planner. It has report cards, transcripts for high-school (full page or columns), progress reports and even a “time spent/sessions” option for those in states that require it. The great thing about finding out that Tracker WORKS for me (after all these years of ‘doing it on my own’) is that it has simplified my teacher duties and made my life easier. I don’t have to create manual assignment lists any more or type up my own report cards. Plus, the kids don’t have to waste time hand-writing out their own lists. I don’t have to hand-write chore lists or lesson plans any more. The program automatically populates the children’s math page assignments across a 180 day school year – skipping my chosen holidays and following my schedule! With just a few clicks – the entire year’s assignments evenly spread out without me even having to do math in my head. Just like that! I can reschedule my assignments in huge blocks so I don’t ever feel like I’m WAY BEHIND any more. This is a huge one for me. I hate to feel the stress of being behind. It turns me in to a drill sergeant. It’s not a pretty thing. I can print out a beautiful, clean, neat assignment list for the kids for the week and they can take ownership of doing the work at their own pace and turning it back to me with initials for me to grade. Did I say beautiful? And thorough, too. With notes and directions and page numbers. Oh my! Grading math is simplified because the program automatically calculates the percentage and letter grade based on my entry of how many problems they missed. No calculator needed. No extra steps. With just a few clicks, I can see how many assignments are past due without flipping through my cumbersome lesson plan binder (that tended towards chicken-scratch after the year was well on its way). If I ever have to put the kids in school, I have a professional-looking resource for printing a hard copy of all they have accomplished. Or I can just print it for fun… to pat them on the back. I can print a high school transcript for my kids so they can apply to colleges… instead of paying someone else to do it. I could go on and on. But I’m starting to sound like an advertisement. In addition to making my life easier, I have also been impressed with the people behind the software (customer service especially). I’ve never had an unanswered technical support or program usage question to Homeschool Tracker’s team. Katie usually writes back within hours. Their discussion group provides a lot of interesting tips and moral support from other Tracker users as well. I’m a very visual learner and have greatly benefited from their free online video training. For those “read it and retain it” moms, they also have a free printable user’s manual you can download. I love helping out other Christian homeschooling families (like the creators of Homeschool Tracker) by using their American-Made products. Best of all, your Homeschool Tracker purchase (if you buy the paid version) is a one-time fee and every subsequent release and upgrade of the system is free! I will tell you that keeping records is not an easy task. The hardest part of doing it, though, is not the maintenance part. The hardest part of keeping records is finding out WHAT works for you (your system), and SETTING IT UP. Homeschool Tracker is such an amazing tool and has so many awesome options for keeping track of every aspect of your school year that you can expect to be required some TIME to get it up and running. Some folks open it and are so overwhelmed by the options it has that they never turn it on again. There’s no magic pill in record keeping that prevents you – the teacher – from having to do SOME work. The great thing about Tracker is that the WORK is almost entirely on the FRONT end. Maintenance is easy. You input your data and then the program can really shine. If you have been searching for something to make your record keeping easier and aren’t afraid of a little data entry and learning something new (Homeschool yourself! ), I would highly recommend giving Homeschool Tracker a try. Disclosure: I like Tracker so much that I signed up for their customer referral program. That means if you buy the program through my ‘code’ (HHGK9), I’ll make a few dollars. I purchased my own copy of Homeschool Tracker a year ago and they did not pay me for this review. My opinion is my own and was not compensated for in any way. If you decide to purchase Tracker because of my review, please use my code and tell them Sprittibee sent you! Let me know what you think! Just type in: HHGK9 when you go to the purchase page on the Homeschool Tracker Website. Thanks so much! I heard of Homeschool Tracker, and have been meaning to check it out. This is our first year homeschooling, so I am not sure what will work for me…but I like the idea of it! I will probably try the free version, but if I buy the other version, I will DEFINITELY use your code so that you can get the referral dollars!! Thank you, this was very helpful. I am also a pen and paper kind of gal and was never interested in homeschool tracker. I was planning to by a transcript software program this summer since my eldest is entering 9th grade. Now I'm rethinking. You've been such a help! I bought HST after reading your review in April. (I used your code!) But with all the really cool bells and whistles, I completely missed the ISBN/Amazon dealie. WOW! I've been playing with it all evening. It's going to be a wonderful help when I start entering this year's readers. I am using another online free system. It is fine a lot of front loading as well. I am thinking about switching only because of the journal feature right now I have to keep a jornal elsewhere. I want to change but I dont because I am 12 weeks into my year. I will think about it more. Thanks for the post. Yes, a friend of mine was using another freebie and I got her hooked on Tracker after she came to my house and saw it…. then she quit using tracker because it was SO MUCH stuff… and a few months later, she started watching the free online tutorials and gave it another try and now she's an evangelist about it like me! 😉 I love seeing her LOVE it. She thanks me all the time for showing it to her now that she has her year planned out and all her assignments ready to go for 2010-11. I haven't gotten that far ahead yet! We are still struggling with 2009-10. 🙁 Maybe someday we'll get caught up! If it were up to Tracker, we already would be. I'm working on March and April assignments with the kids right now. It is so nice to have them all in there and only have to click a few buttons to grade them when the kids finish them, though. I'm SO glad you reviewed this for us, Heather! I taught in the public schools before we had kids and had some old leftover lesson plans books. So that's what I've been using for the past 7 years of "official" homeschooling. So this was very interesting to me since I'm within a few pages of being done with that book. Will look into at – and if I DO buy, I'll make sure I do it through your link. Thanks!!! Yep, I just did it- ordered the download (with your referral code, of course!). Now to get busy figuring it all out and getting our 2010-11 homeschool plans TOTALLY organized (loving the transcript features, and SO much more)!! Whoo-Hoooty! *excited* Thanks for the timely *push* Heather, this is just what I needed! I am beginning to love my HST system. When I first got into it the program overwhelmed me, and I think it's just because I am NOT a computer savvy person. Plus, I am doing Konos, so I had to figure out my "system" for keeping track within the new system since Konos overlaps subjects and it was hard for me to figure out how I wanted to input it all–finally decided to input according to the character unit. I had my husband (who does computer systems for global bank projects) sit down and help me figure it all out. Within minutes he had everything set up the way I wanted. (And thanks Heather, for the encouragement along the way!) Anyway, this is just to encourage anyone else out there who is NOT a computer person…find someone who is because the program is worth it! And even though the state of Oregon doesn't require me to keep detailed records, I feel much more on top of things knowing that I am starting this early in our homeschooling career. I've been using it for a few years now. Right now we only have the free version, as it does everything I need it to do. I think when my oldest gets to high school level I'll upgrade to the Plus edition. All the info should just move over with the upgrade. I love using it. I still do lesson plans in a book, but I love having HT to keep grades, book lists, etc., and this way I don't have years' worth of lesson plan books piled up around the house. :o) My only problem is making sure I keep it updated. Last year I went 14 weeks without inputting anything, and then spent pretty much my entire Christmas break trying to get it all caught up! So far this year, I'm grading and inputting every day! I use HST+ too and LOVE it! I recently switched to Mac and unfortunately the program doesn't run on Mac (unless you purchase parallels). I hope HST will consider a Mac version! If you enter your assignments in the Lesson Plan Grid, they stay there forever – even after you "assign them" to a kid. Then you can pull from them for other kids in the future. Assignments are specific to one kid, Lesson Plans are not. But then again, I believe you can also transfer assignments to the Lesson Plan grid… and then use them again. I would watch the online videos for this to see how it works. It really is amazing – and easy to learn with the videos. Thanks Gwen! 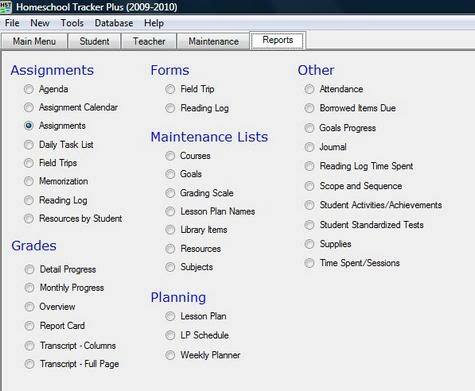 You'll love this program if you are a teacher and have ever used any kind of program for school tracking before. I was a registrar at a private school and like this program better than the one they used. Thanks for ordering it, Beth! I'm still praying hard that funds come in for me to get up there to see you, girl! Pray me to Relevant10!!! Yvonne – The lady that introduced me to Tracker's name was Yvonne! Make sure you get your credit! I have had and used THT for years. LOVE it. The inly down side, besides the learning curve is that is doesn't work on MAC! 🙁 So, I decided not to use it this year. As all my school stuff in on my MAC and THT is on my dinosaur windows all the way across the house! UGH! I found your blog through Google. I don't know you, but I'm a first time homeschooling mother. I just purchased Homeschool Tracker and used your referral code. Thanks for your review! I have homeschooled 18 years. Only three more children and another 8 years to go and we'll be done. 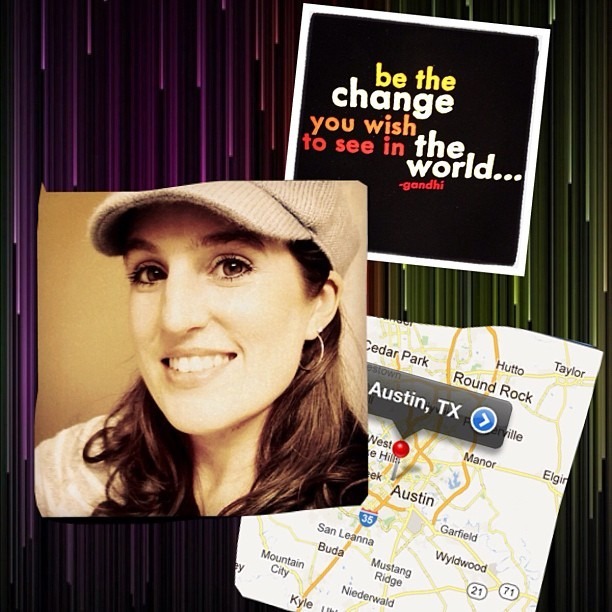 Believe it or not…I'm ready to try the homeschool tracker plus, who says you can't teach "old dogs new tricks". What great information about HST! it maybe just what I need! I am glad to hear your success with Tracker. I am having terrible trouble figuring it out. I can't figure out how the different tabs correspond and don't know where the best place is to enter the assignment information. It seems that I can only enter one assignment at a time. I am using Abeka, so the lessons are already divided up. Should I enter everything in Lesson planning? Can I enter a whole year at a time by copying? Please help! Taunia – The Tracker website has a great video tutorial section that helps with the HOW TO on entering assignments. I use the Lesson Planner (which is somewhat like Excel spreadsheets) and then schedule assignments as we go along with the school year. The website also has a really QUICK chat section at the bottom for questions that you can't find answered on the website or in the videos and they answer within MINUTES and do a live chat with you. They have the best customer service of any product I have ever bought – be it homeschool related or not! Oh my goodness. I used the basic version last year and it was just too clunky that I didn't have the patience to enter everything. I tried out Plus and I absolutely love it! The lesson plan feature is amazing and makes such a huge difference. That and the ability to reschedule things easily is great! Well worth the price for my upgrade, which I just got using your code. thanks for the great review and info. It made me take the leap and our year will be so much better for it. I know I am very late reading this post, but I had to say thank you! I have had HST+ for over a year, and have been so overwhelmed I haven’t really even used it. I appreciate you breaking down all of the features. Yes, it took me a while to start, too. I’ve been off the saddle for a while. Feeling the pressure because my 16 year old is taking driver’s ed and I have to provide transcripts to get a discount on our insurance! YIKES! Back to the data entry seat for me! Trying to get opinions and wondering if you’ve made the switch to HST online or still using Plus? I’m using Plus, but in all honesty, I didn’t use it at all last year. I’m about to open it tonight and enter all my assignments for this school year since I planned out history over the past couple of days. Last year my kids did a lot of co-op and outside tutored / online courses, so I wasn’t the teacher. I’m just giving them a transcript based upon their other teachers’ grades from last year. This year I’m more involved. When I saw the option for a referral code, I googled it and found your site. Always great to be able to help other homeschooling mamas! It is 2014 and I put in your referral code! I have no idea if it worked, but I googled it and you were the first one on my results that had a code listed!